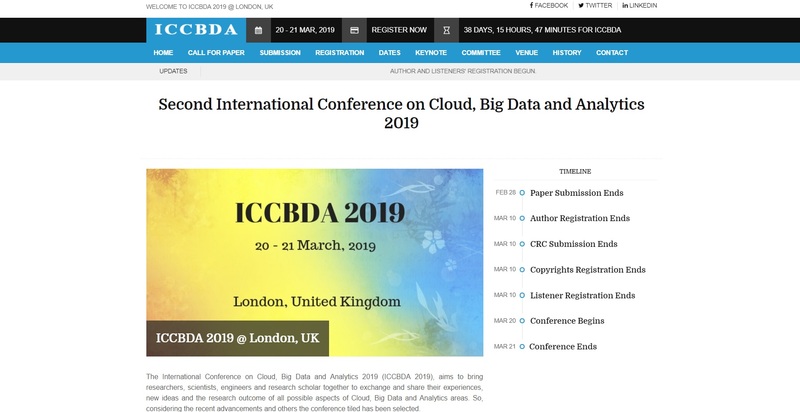 The International Conference on Cloud, Big Data and Analytics 2019 (ICCBDA 2019), aims to bring researchers, scientists, engineers and research scholar together to exchange and share their experiences, new ideas and the research outcome of all possible aspects of Cloud, Big Data and Analytics areas. So, considering the recent advancements and others the conference tiled has been selected. ICCBDA 2019 ONLY accepts unpublished research papers in English. Submitted conference papers will be reviewed by technical committees of the Conference. All accepted papers will be published in the conference proceeding by Association of Scientists, Developers and Faculties and indexed by EDLIB which in turn indexed by other major indexes.